Additional Info: What we are offering is a home from home,. This is a top of the range Pemberton Lodge with a high spec interior. Rated by the tourist board as gold 4 star accommodation comprising 3 bedrooms, full sized bathroom, large living room and a fully equipped kitchen with a large American style fridge, dishwasher, microwave, washing machine, 49 inch TV in the living room, TVs in 2 bedrooms, Xbox one, *** FREE WIFI*** large deck with patio furniture so you can sit and chill of an evening looking out onto Badger lake. Quality appliance and furnishings throughout. Max occupancy is 6 plus 2 cars, any suspected over occupancy will be reported to us by security ( 3 cars at the Lodge can possibly be an indicator there are more than the 6 guests) over occupancy will lead to additional guests being asked to leave. £100 non refundable deposit with the balance due 8 weeks prior to your holiday. Linen can be hired and beds made up fir arrival , it’s £25. All booking is done through myself. Payment can be made by BACS or PAYPAL. Confirmation will always be sent when payments are received. This is stunning Lodge , with high quality furnishings throughout. Passes are not supplied , they can be purchased from reception. Linen can also be hired if required. We had a lovely time thank you! You have a beautiful Lodge and we Would definitely like to book again with you in the future. We've had a great time here, thanks again, we will definitely be booking with you again and recommending to friends and family. We will definitely come back soon, we've stayed in a few lodges on castle lake but prefer badgers lake. Your lodge is beautiful and had everything we could have wanted. 1/8 - beautiful lodge, in a beautiful setting. Couldn't fault a thing. My family had th best one ever. Every much enjoyed a glass of wine in the evening on your lovely deck at the back of the Lodge. 5/8- Thanks so much.what a beautiful lodge told lots of friends and family.will put it on Facebook if that's alright.Barry& Sue. There is also loads to do in the surrounding areas like a trip to Holy Island or Bamburgh Castle or if it's retail therapy you are after, the Metro Centre is only 1 hr s drive away, or pop into Berwick and take the train. This lodge is fantastic. So spacious. The extras the owner has included are fabulous - such as the Xbox (with lots of games) and the soundbar. Where the lodge is situated is a good 10-15min walk to the complex but our kids took their scooters so this was no problem. The lake right at the back of the lodge is beautiful and the ducks and geese amused the kids in the mornings. Heather was perfect to deal with. Quick to respond to any queries i had. Couldn’t recommend the lodge any higher. Next time we want to come to Haggerston I’ll definitely be checking if it is available. We stayed in this beautiful lodge overlooking the lake for a week. Could not have wanted for anything more ,1st class accommodation. Fantastic quiet location with all mod cons. We will hopefully be booking with Heather again as it was a pleasant and professional transaction keeped informed throughout every step of our booking. Thank you Heather. We had a wonderful stay. The lodge is a nice size, in a quiet location. The beds are lovely and comfy, a nice big tv with Xbox 360. A great big fridge which keeps things icey cold unlike some of the other fridges we have encountered in other lodges. The lodge is located overlooking a lake and is right next to a play area with a slide which is great for young kids. 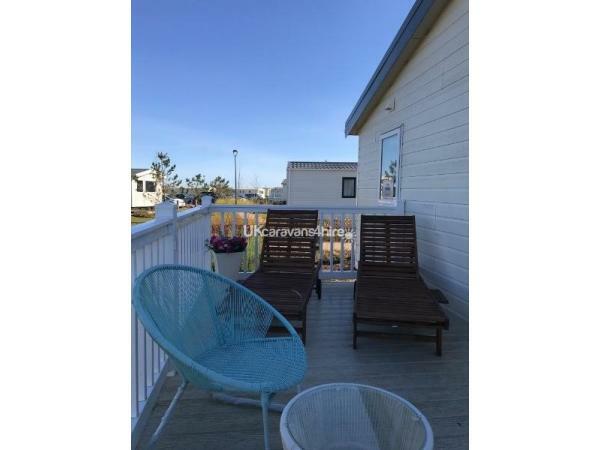 In conclusion a wonderful lodge which will make your holiday at Haggerston extra special. This was our third time booking with Heather, but our first time staying in this stunning lodge. We were all speechless when we walked through the door. There is nothing this lodge doesn't have. Set in a beautiful and peaceful location, you couldn't ask for more. Thank you, Heather, we hope to be back again next year! Thank you so much for hiring out this beautiful lodge, it was very luxurious with everything we could possibly need and the setting by the lake was lovely too. Heather was very professional to deal with and we are already looking to return soon. 5* plus. Has to be the best we have ever stayed in and we have stayed in many on this site and other Havens. 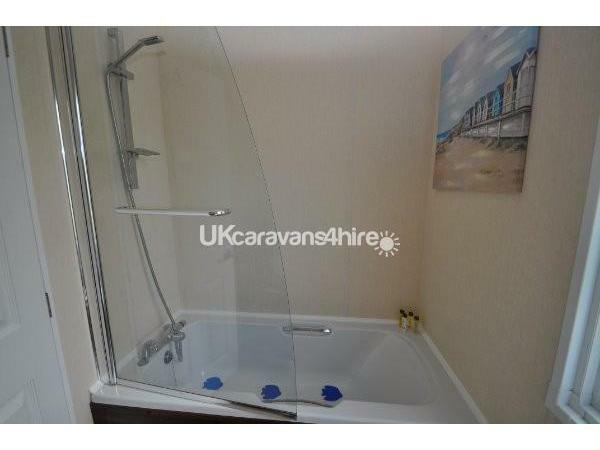 This isn’t anything like a caravan , it’s like a villa due to its size and modern top quality furnishings. Can’t rate it high enough, we stayed for a week but could have easily stayed another week.. Fantastic lodge in a beautiful location. The lodge is very comfortable, spacious and well equipped. We were very lucky to have enjoyed the fantastic weather and able to sit out on the deck overlooking the lake. Well done on such a great lodge and thanks Heather, we all had a great time. Will likely be back in the near future. A special lodge . We have stayed in many lodges over the years and this one was by far the most magical. From the moment you enter the lodge you feel at home. The lodge is decorated beautifully and has everything you will need for your stay. The view from the lodge is something special and so peaceful. The TVs in rooms were an added bonus and so was the x box . We cooked at the lodge and the kitchen dining area made for a great social space for dinner. The kitchen is well equipped there was nothing missing . We can’t wait to book again and will definately stay longer next time. We have just got home after a weeks holiday in this beautiful holiday lodge. The accommodation is excellent with everything you need for a home away from home. The decor in this lodge and facilities are the best we have experienced. The location is perfect for families with older children. We would definitely recommend this to others who want a relaxing holiday. We fully intend to visit again. Thank you Heather for everything. The Scargill family.